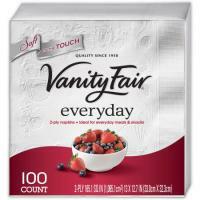 Vanity Fair makes quality napkins and towels you can be proud to use in your home. They're soft, strong and beautifully detailed. They add add a special little touch your family and guests will appreciate.